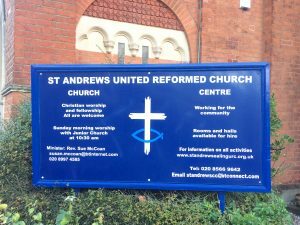 St Andrew’s, like the United Reformed Church of which it is part, is an evolving Church and there is much that is new here. Our life and beliefs are firmly anchored in the Gospel of Jesus Christ but we seek to interpret them in the world of the 21st century. We rejoice in the benefits of new technology and in the multicultural society that is Ealing. We work for a world of justice and peace and of genuine care for creation. The United Reformed Church (URC) was formed in 1972 by the union of the Congregational Church in England and Wales and the Presbyterian Church of England. It then united with the Re-formed Association of Churches of Christ in 1981 and the Congregational Union of Scotland in 2000. The URC stands in the historic Reformed tradition, the largest single strand of Protestantism, with more than 70 million members worldwide. We meet for worship on Sundays at 10.30am, with Holy Communion on the first Sunday of the month. We hold frequent meetings to reflect on the Bible and Christian faith, which appear under What’s On. The Church is committed to issues of justice and peace. It supports the ‘Commitment for Life’ programme which is sponsored by Christian Aid and the United Reformed Church. We have a Traidcraft Stall after the worship service on the fourth Sunday of the month and have several links with the wider world church.